Welcome to White Postcards, we are Canadians currently living in the picturesque town of Brockville, Ontario, located within the world-renowned Thousand Islands region. Like many, we have taken the traditional route, got married, bought a house, raised great independent children; we have worked hard and are saving for retirement. We have always enjoyed travelling, weekend trips to Cape Cod, our Honeymoon trip to Spain and Portugal, annual March break trips to Florida and California with the kids, but we never strayed too far from home. In fact, our children have been to Europe as many times as we have. 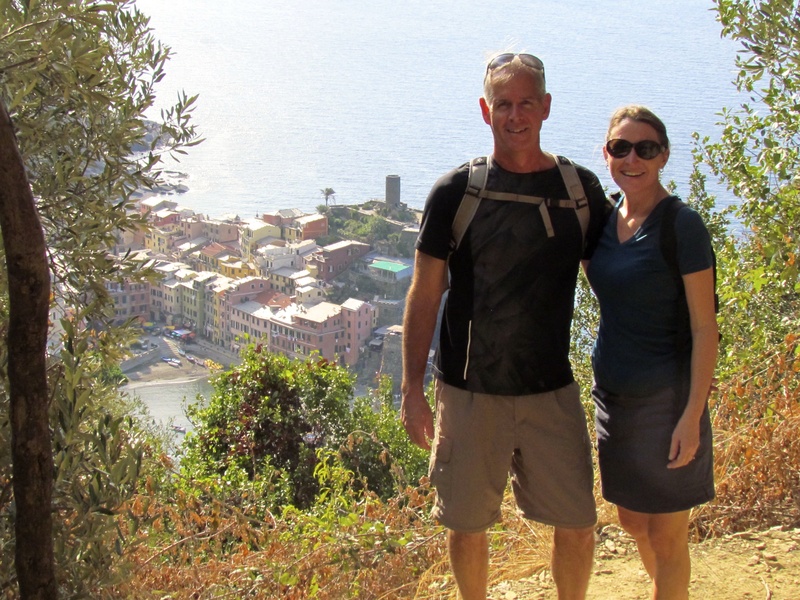 A couple of years ago we became empty nesters and celebrated with a three-week adventure to Italy, France, Holland and Belgium. That’s when the travel bug hit us. “Wait a minute!” we don’t want to wait till retirement to have great travel adventures. So here we go, September 2016, we will embark on a one-year journey around the globe. That’s 890 730 580 431 315 60 days from now, with so much research (where to go? what to see? ), planning (budget, itinerary) and decisions (sell or not sell the house?) to ponder, we decided to document our process. Making this happen here on the worldwide web will become part of our RTW story. In the meantime sharing our mini travel adventures, photographs and whatever else we find relevant we will yak about. Eventually, we hope this will be the place where our family, friends and new friends can stop by to see what trouble we are up to. That’s the plan so stick around and look for our postcards! We love to explore charming old cafés and pubs, make spur of the moment decisions at four-way stops, colourful art and photography, hiking and trekking (we are aspiring Adirondack 46ers, countryside fresh air over big city smog, sunrises and sunsets, up-cycling and recycling, and proud of being frugal. Hi Ginette and Gordon, nice to meet you. Great plans! Good luck with all the changes and travelling to come. Thank you for following our blog. I am honoured. I hope you enjoy the stories of our journey, both inner and outer. I can’t tell you how excited I was to have you as our first ever comment on this blog! You two are truly an inspiration! Thank you for sharing your adventures. Oh thank you! That’s so nice to hear. You’ll have an amazing time. Hi Ginette and Gordon, thank you for your visit to my blog. Your blog is also very interesting. And good luck with your RTW trip, however, I can’t believe that you have to wait for another 2 and half year???? Oh how I wish we could take off sooner! We are planning our RTW travels to correspond with our youngest daughter graduating university. In the mean time parental and work commitments will keep us close to home, with some short term travel in between. You will have a busy year getting ready for your travels and I hope you will share some posts about that process with us. I’m looking forward to your blogging and photography about your new nomad life. Hi Sheena, Adding Malaysia on our itinerary:) We’ll definitely take you up on that offer when the time comes…and arrange to meet up with you wherever you might be! Thanks for following our blog! We are certainly hit with the travel-bug too. Wow – 2016 will seem a way away when you are looking forward to something so amazing and probably can’t come soon enough 🙂 Look forward to following your preparations and see how it all unfolds! Great introduction! I wish you luck with your great adventure and look forward to following along with anticipation. Thank you for stopping by my blog earlier and leading me here. I love your introduction and your blog! Looking forward to reading more about your travels around the world! I’m so glad that you are doing the round the world trip. 2016 will be here before you know it. Hi fellow Ontarians! After reading the comments above, I feel my 2018 RTW trip is REALLY far off! I look forward to following you around in 2016! Ginette and Gord, I am so impressed. Sounds like an awesome trip. Make sure you add Turkey to the agenda and in particular Cappadocia. The caves there are amazing. I spotted your Gravatar image on another site. A pleasure to meet you. Your site looks interesting. Thank you! We hope you will visit again for more of our virtual postcards. You guys got it figured out.. Best of luck..
PS We were in Brockville just over 28 years ago and loved the Thousand islands region. PPS Our eldest son is named Brock! Hello Karen and Mark, so nice of you to leave us a note. Our recent (too-short) trip centred in Provence and interestingly we visited many cities you visited. We truly enjoyed the region, and the fishing port of Cassis was a highlight for us. We’ll be posting more about the trip for sure! I’m Leo. Me and my wife Daniela were the couple celebrating their third anyversary! Earthquake included! It was very nice to meet you, and we wish you the best in your wonderful journey across the world. I’m writing you also if you please remember to sent us the pictures you so kindly took us that day. Our emails are dani.silvaa@gmail.com, and lahernan@uc.cl. Hi Gord, I finally got a chance to check in on your adventure. The pictures are just beautiful. I think when I saw those gorgeously coloured houses on Isla Grande de Chiloe, I may have settled right in and not gone any further. Hi Mary, Thanks for checking in on us. Isla Grande Chiloe is a treat to visit. Ten days ago we were in Buenos Aires and it was in the 30’s (too warm). So we flew 11500 km to visit some friends in the UK and got back into the chilly but Christmas weather. Currently, we are in Barcelona where the weather is sublime, sunny and 16 C….keep checking in on us. Very nice to find you here. Hope you are still on your track and in good shape. Maybe see you some days in Beijing.